There are three components to playing loud on an acoustic guitar, and two of them are probably built in to yours. You'll want to choose the third, the acoustic guitar amp, carefully. Those three components are the pickups, preamp, and the amplifier itself. If you've got an electro-acoustic guitar, it will have pickups built-in, and will almost certainly also have a preamp. Onboard preamps vary widely from the very basic, and discreet, which sits in the endpin socket, to those which sit on the side of the body near the soundhole and have all sorts of knobs and eq sliders. Outboard preamps are useful if you want more control over tone and come in all sorts of formats, including ones that clip on to your belt and others which sit in a stompbox. Then, there are the preamps which are built into the amp itself. 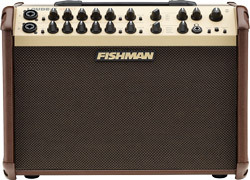 Assuming you've got the preamp covered already, then, how do you choose an acoustic guitar amp? Acoustic amps are very different beasts from electric guitar amps. The preamp circuitry is different for starters, as is the circuitry for controlling the tone. And acoustic guitar amps have a wider frequency response than those intended for electric guitars. So, the first point to note is: go for a specialist acoustic amp. Next, you'll want to think about inputs. You will, obviously, need at least one instrument input. Some acoustic guitar amps also have a microphone input – useful for vocals if you don't want to rely on the venue's PA or for locations where you won't have access to a PA. And some acoustic amps also have inputs for gear like a CD or MP3 player. That could be useful, depending on your set-up, but remember the output will almost certainly be mono. Most of the time you'll be using the amp's speaker for output, but if you plan on recording, you'll need a DI output to convert the high-impedance from the amp to a low-impedance signal suitable for input to a mixing desk. This is usually in the form of an XLR socket. You might also want a second direct output or an effects loop. Again, this very much depends on where you plan to play. Most amps come in the 60-100W range. The higher end more suitable for gigging, the lower, for rehearsing and playing in your bedroom. As a minimum, you need basic bass, treble, and mid-range controls. Some amps have multi-band equalisers for finer control, and others have a parametric mid control, which allows you to boost, reduce, or even eliminate specific mid-range frequencies. A notch filter will allow you to suppress feedback, and compression evens out the signal to stop you damaging the speaker by pushing to too high. Finally, there's reverb and delay. Good reverb and delay can be very effective tools in creating the ambience you want for your playing, so test them out before you buy. A 120W amp from the company best known for its pickups and preamps. It has two channels, built-in effects, feedback prevention, and lots of output options. 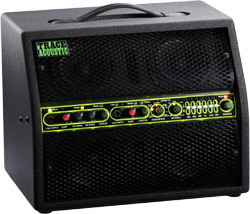 Designed in the UK, made in the US, the Trace Elliot TA-200 is a 200W combo that has tons of features, a 'punchy mid-range' (according to Acoustic Guitar magazine) and lots of footswitchable presets. 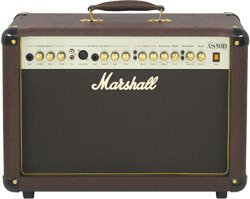 The Marshall AS50D is a 50W acoustic amp with two channels, one each for guitar and microphone, and each with its own volume, EQ, FX loop, and D.I. Output. There's also digital chorus and reverb, and anti-feedback notch filter, master volume control, line out, and RCA inputs so you can use it as a PA. Versatility ain't the word.